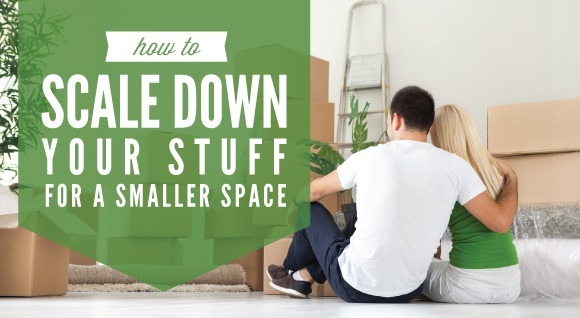 Home » Tips for downsizing your space! Have you thought about downsizing your space lately? In order to do so, you will most likely need to also pare down your “stuff”. Here are a few tips to make the process a bit easier. Start as early as possible. Give yourself about 3-6 months to gradually scale back your belongings so you aren’t tempted to throw everything into boxes as moving day approaches. Pace yourself! Don’t try to do too much at once–take an hour or two each day to go through things and decide what to do with them. Start with a drawer at a time. Try to clear out one particular room before moving on to the next. Sort your things as you go along. Make “keep”, “sell” and “donate” piles/boxes to keep things as organized as possible. Be ruthless! Think long and hard about what you actually need in your new place. Get rid of anything you won’t use. Plan your new space. Get a copy of the floor plan, measure and make sure your furniture will fit. For more downsizing ideas, click here!